You might remember seeing faded prints of sad, haunting, waif-like children with overly large eyes, displayed in charity shops or in houses during the 1960s and 1970s. 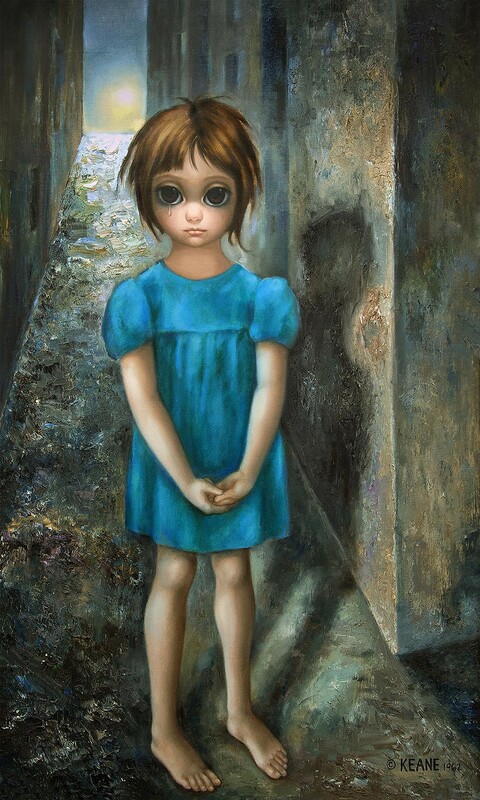 However, did you know that the works by American artist Margaret Keane, though derided by art critics and dealers, hung in the mansions of major Hollywood stars and in European museums? Or that her paintings were praised by artists such as Dali, Picasso and Warhol? Through mass marketing, Margaret’s work became was incredibly popular with the general public. It sold millions of copies, when reproduced in affordable forms such as wall sized posters and cards, which you could buy in supermarkets and gift shops. Margaret’s waifs influenced the style of other painters and graphic artists. Unfortunately, Margaret never received the money that she earned from sales of her paintings, nor received the recognition that she deserved until recent times. Produced and directed by Tim Burton, the movie Big Eyes stars Amy Adams and Christoph Waltz. It is based on the true story of how Margaret’s husband Walter Keane created an elaborate deception, fooling the world by claiming credit for his wife’s art. The film opens with the statement that the 50s was a great time if you were a man. Fleeing a bad marriage in the mid-1950s, shy suburban housewife Margaret Hawkins flees to San Francisco with her young daughter, where she makes her living painting motives on furniture. She supplements her income at an outdoor market, painting children’s portraits in her distinctive style because “The eyes are the window to the soul”. It is there that Margaret meets the charming, ambitious landscape artist and real estate salesman Walter Keane. When Margaret’s former husband attempts to declare her an unfit mother and secure full custody of their daughter, Margaret accepts Walter’s offer of marriage. 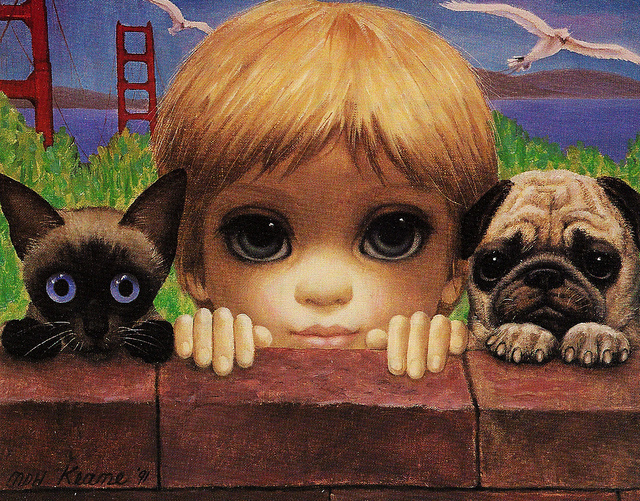 Amy Adams plays Margaret Keane in Big Eyes. 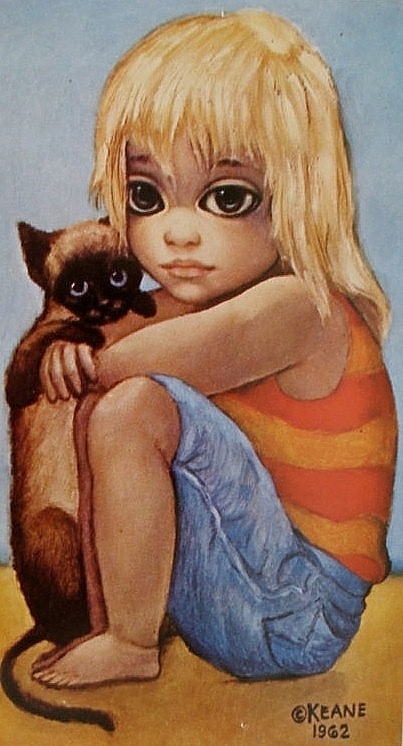 Margaret Keane, Little Ones, 1962. Always the opportunist, Walter seeks out new ways to sell their art. He rents out wall space in a popular club. 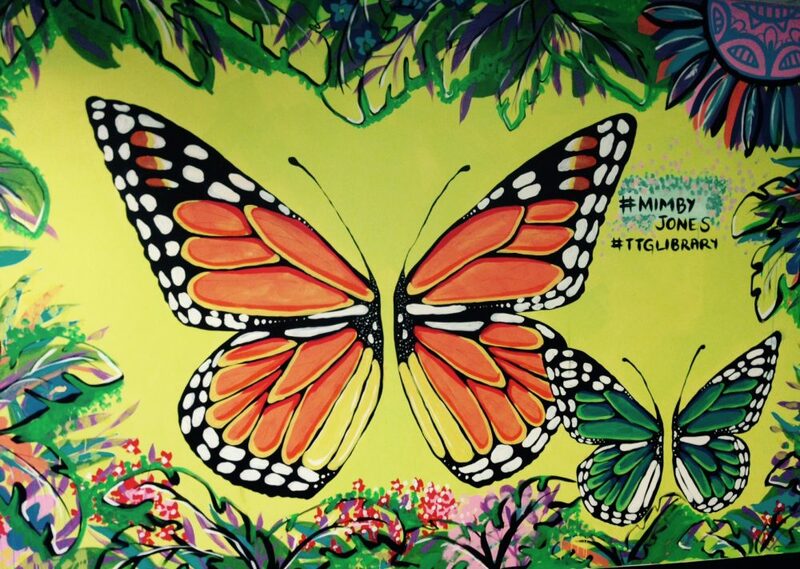 When patrons of the club start to notice only Margaret’s paintings of children, Walter takes credit for her work. The lie builds in intensity, as famous identities come to the club to see buy the pictures and the media takes an interest in this latest trend. It is not until Margaret watches Walter selling the paintings at the club does she realise what is happening. Although she is disturbed by Walter’s behaviour, Margaret has so little self esteem that she reluctantly goes along with the charade. She loves Walter and tells herself that she is doing the right thing. Remember, this was an era where women were expected to defer to the judgment of the head of the household, to their husband or father. Big Eyes handles serious themes such as violence towards women, but Tim Burton’s quirky influence comes through. Sets are beautifully designed and there is a sense of otherworldliness to the look of the film. Burton uses warm lighting, bright colours and intense pastels in the cinemaphotography and he depicts suburbia like a model village, reminiscent of Edward Scissorhands. The film has elements of a fairytale. Margaret’s character is Burton’s usual blonde protagonist. She is the innocent woman imprisoned in a tower, living a nightmare. In in her attic studio, she is forced by her evil husband to paint magical pictures for up to 16 hours a day. Christopher Waltz plays the deranged Walter Keane. Burton’s brand of comedy comes through in both his characterisation and in his presentation of peculiar situations. For example, the exceptionally sweet Jehohavah Witness ladies arrive at Margaret’s door and change her life. An art snob who runs a fashionable modern art gallery rejects the paintings of waifs as kitsch but tries to sell splotches of paint on canvases to wealthy customers. Christopher Waltz expertly plays the egotistical Walter Keane, depicting his flamboyance and over the top mannerisms. Yet we are never in doubt of how sinister and deranged the character really is. Big Eyes is also the story of Margaret’s triumph. As society starts to change for women throughout the 1960s and 70s, Margaret will find the courage to take control of her life and fight for her reputation as an artist. San Francisco Here We Come, 1991. Did you know… that today is international Batman day? Created by Bob Kane, Batman first appeared in Detective Comics #27 way back in 1939, the second major costumed superhero to be introduced by DC Comics after Superman. The Dark Knight is ranked second only to Superman in IGNs top 100 Comic Book Heroes of all time and has been adapted to both the small and big screen, with perhaps the most iconic portrayals being Adam West in the 1960s Batman TV Series, Michael Keaton in 1989s Batman (directed by Tim Burton) and Christian Bale in Christopher Nolan’s Dark Knight Trilogy. Next year (2016) will see Ben Affleck take on the role in Batman V Superman: Dawn of Justice. In comics, Batman has been written by such legendary figures as Alan Moore, Frank Miller, Grant Morison (who actually killed Bruce Wayne in RIP/Final Crisis) and Scott Snyder. Why not checkout the library’s collection of Graphic Novels or DVDs and live the excitement that is…BATMAN. Click on any title or DVD cover above and you will be taken directly to the library catalogue reference, where you can place a hold on the item. Since you can borrow 20 DVDs at a time, you may like to place requests on all of the above titles at once! On Thursday, Legendary Pictures will be bringing the monster Godzilla back to the big screen in an epic blockbuster that has been more than four years in the making. But what do you actually know about the titular monster? The original Godzilla from 1954. The creation of Godzilla can be attributed to no single person, but rather a collaborative effort between Toho producer Tomoyuki Tanaka, Director Ishiro Honda and special effects genius Eiji Tsubaraya. Inspired by the bombing of Hiroshima , Pacific Nuclear Tests and the incident involving the fishing boat Lucky Dragon 5 in addition films such as King Kong and The Beast from 20 000 Fathoms. These three men bought to life the story of an ancient creature, awakened and irradiated by atomic testing that proceeded to lay waste to Tokyo. 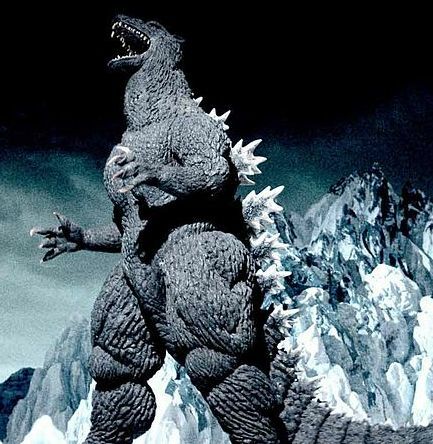 Godzilla as he appeared in 2004s Final Wars. 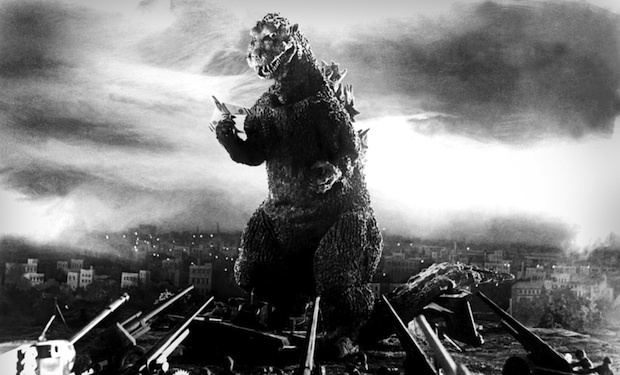 A serious film, the creature served as an allegory for nuclear weapons and the devastation they had wrought on Japan. 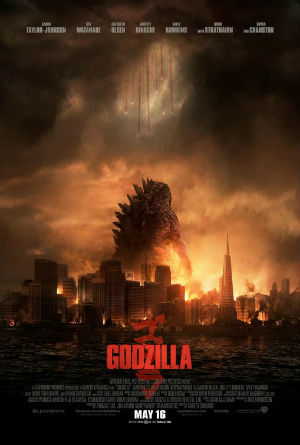 The film was dubbed and re-cut for release in the West in 1956, re-titled as Godzilla – King of the Monsters. A box office smash in Japan and quite successful in the West, Godzilla would go on to star in a multitude of sequels, divided into the Showa (1954-1975), Heisie (1984-1995) and Millennium (1999-2004) series. The first all-American made film was released 1998 by Sony/TriStar to somewhat mixed reactions. Will the Legendary Pictures effort prove to be more satisfying? Before seeing the film, why not check out some of the old Japanese movies, or compare it to the TriStar effort, or why not check out some of the great Graphic Novels being produced by IDW Publishing. Bond is back, uttering his famous catchphrase in the film Skyfall, but did you know that many of the character catchphrases we think we know are actually completely wrong? Sherlock Holmes never once said “Elementary, my dear Watson” in the works of Sir Arthur Conan Doyle. The closest he ever came was to say “Elementary” when explaining a deduction in “The Adventure of the Crooked Man”. “Beam me up, Scotty” – Star Trek’s Captain Kirk would say “Beam me up”, “Energize” and (once, in Star Trek IV) “Scotty, beam me up”. “Luke, I am Your Father” – Vader actually says “No, I am your Father!” in The Empire Strikes Back. And that’s only a few of them! Click the links to look up these titles in our catalogue. Video Dominoes Clip Hits 10 000 Views! 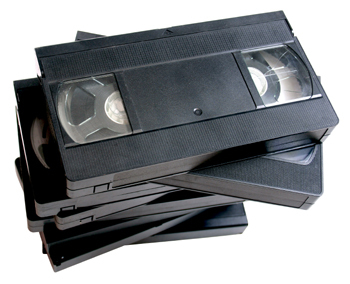 Just over two years ago, we made the decision to debit our video cassette collection. Since 2005, no new films had been released worldwide on video cassette, and the space the collection occupied could be better used to accommodate the ever-growing number of DVDs in the collection. As part of the collection’s “send off” we decided to play dominoes with the deleted cassettes. The domino line made its way around the entire library, passing every major collection before finishing up in front of the DVD shelves. The spectacular was filmed and uploaded to YouTube and I am pleased to say that last week, it hit the milestone 10 000 views! You may have noticed a couple of weeks ago that access to the DVD collection was a little limited for a few hours? Well, we were busy that day revamping the DVD collection and we’re pretty happy with the results, as are many of our borrowers, who have given us some really positive feedback. It’s now much easier to find what you want! DVD collection - lots of categories to choose from. As well as quite a lot of planning, it’s certainly been a mammoth task for our Technical Services Team who have been relabelling and reclassifying the collection and are continuing to do so as items are returned. With around 10,000 DVDs in our collection, it will be an ongoing process for a while yet! 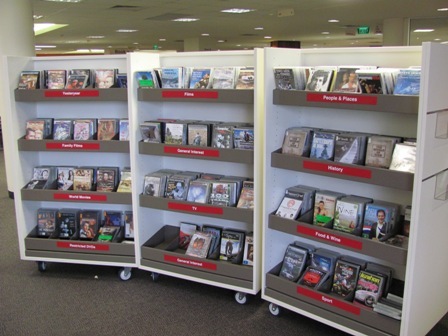 Next time you’re in the Library, take a look, choose a great DVD and let us know what you think.